First, I have no affiliation with these guys. This is primarily an endorsement of a (rare) company that stands behind their products. I had a 7000 charger from this Swedish maker, chosen for the many tasks the smart charger accomplishes. I'd used it as a battery charger/maintainer on two standard 12v car (lead acid) batteries and for reviving a pair of 12v wheelchair batteries (sealed lead acid GSM), that were reported dead. they seem just fine. I also find these chargers finish a charge cycle much faster than other smart. and not chargers, I have used. Using this smart charger has spoiled me, as I can forget worry about overcharging or leaving it on too long. 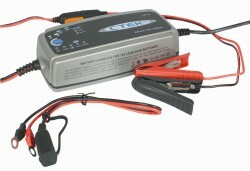 They go into a maintainer status, eliminating ruining batteries in little used vehicles. At 18 months, the unit died. I was not happy, given the cost, so I e-mailed two cTek officers. Both, yes both, replied within an hour; the Regional Sales Manager and Chief Tech Officer (sent his cell #). I did not call but e-mailed the sales mgr., who replied that the units had proven so reliable, that they had extended their warranty from 2 to 5 years. He had a new 7002 sent to me when my out-of-warranty 7000 arrived there. I have no qualms about chatting up lousy products, nor any about lauding positive experiences.